March 2018 – As we started the first few weeks of the Chinese Year of the Dog, we realized that it really is a dog’s life out here in our cozy little RV. 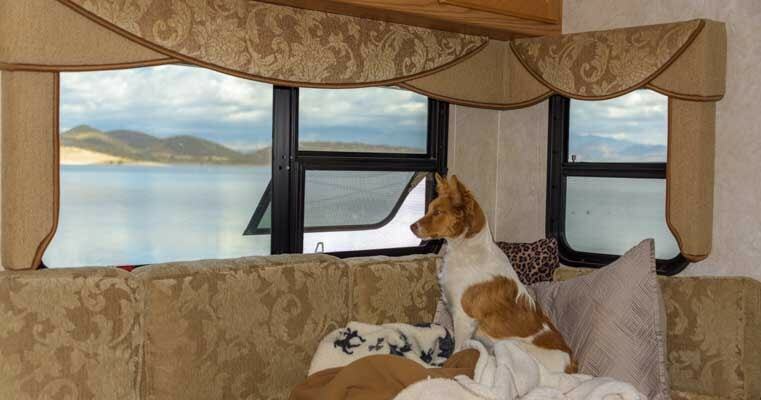 It’s a dog’s life in our little RV. The best part about it is there’s always an endless range of possibilities waiting for us just outside our RV window. And for folks like us whose home address is a campsite, there’s nothing like camping out on a lake! 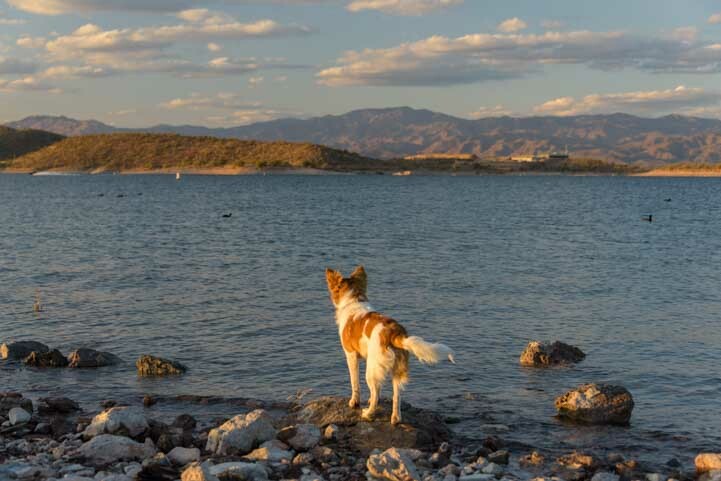 Buddy loves exploring the shores of Lake Pleasant. There’s always something going on out there on the lake, whether it’s people fishing from their boats, or folks out sailing, or pretty ducks floating by. Mark took some old bread down to the shore to feed the ducks. Buddy was fascinated and watched intently. Mark and Buddy feed the ducks. Since we took Buddy under our wings, we have discovered that he is quite the socialite. Where we kinda stick to ourselves and lead quiet lives, Buddy likes to be the life of the party. He happily trots from RV door to RV door to find out just where the party is. 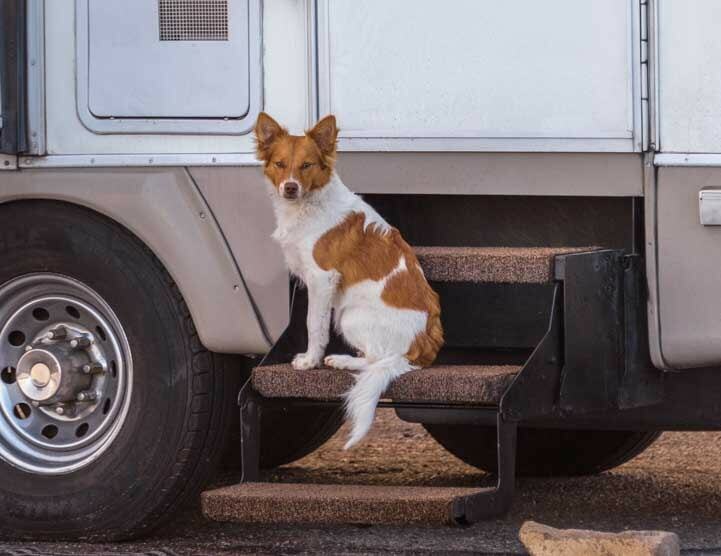 Buddy is at home on the fifth wheel steps. But this isn’t our fifth wheel! As one glorious lakeside day rolled into the next one, we were blessed with many magical moments. One of the first was when we woke up to see fog and snow on the distant mountains. 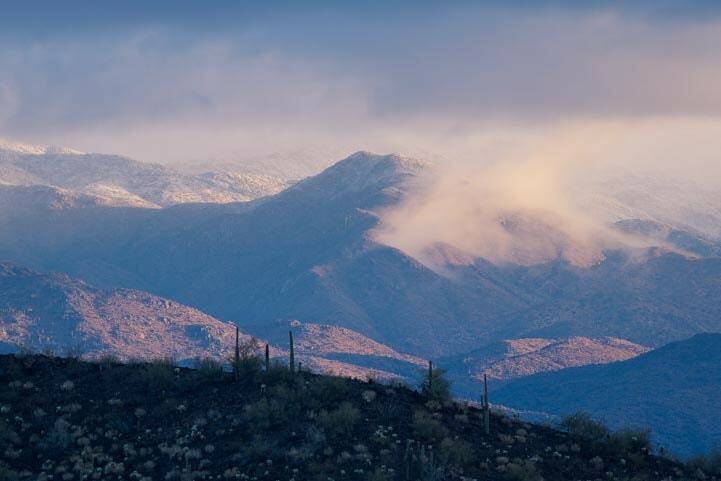 This isn’t very common in the Arizona desert, but it is truly magical when it happens. Fog and mist swirl around the distant mountains. Another morning we suddenly noticed a hot air balloon drifting over the lake. What a fun surprise! 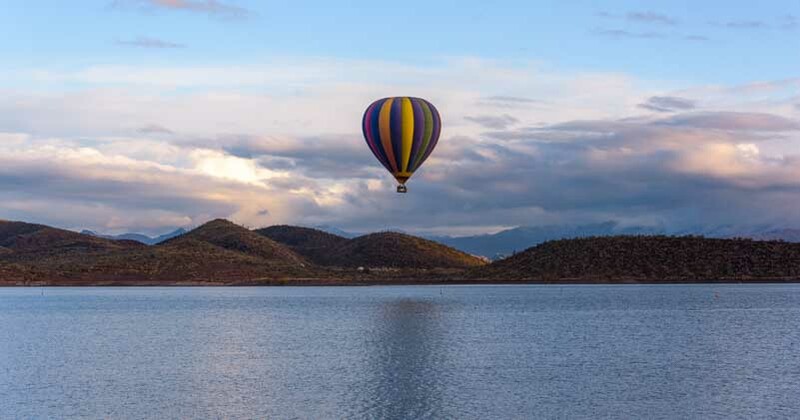 On a cold morning we noticed a hot air balloon sailing over the lake. 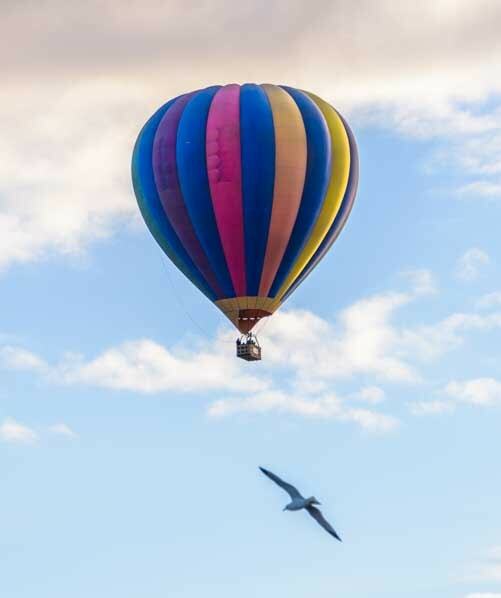 And then, in the blink of an eye, the magical moment had passed and the balloon disappeared in the distance. 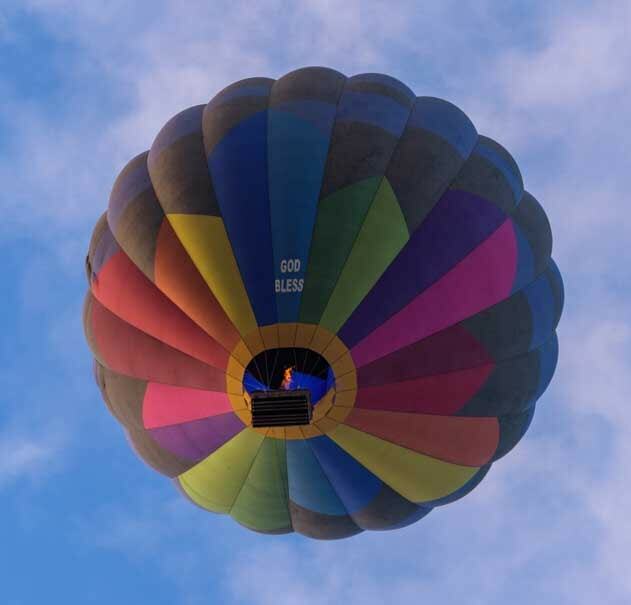 The balloon slipped from view. One afternoon I returned from a little hike with Buddy to find a crowd of people staring at the dock. A bald eagle had just landed on the dock and was making short work of a fish he held down with his feet. 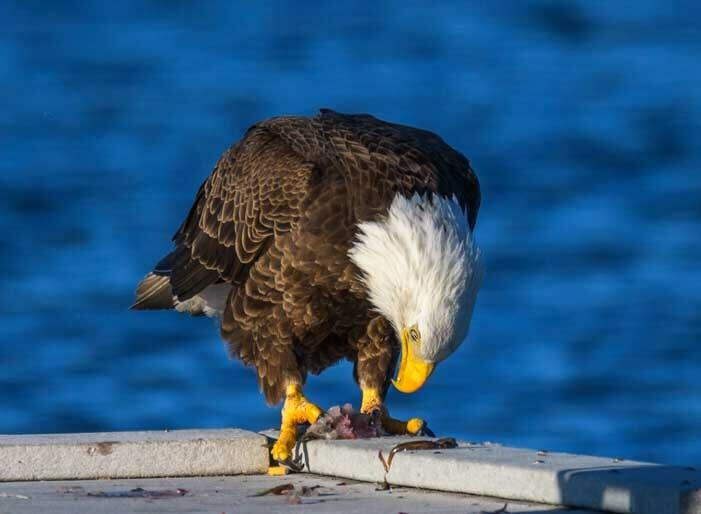 A bald eagle stands over its catch. I was floored at how big the eagle was. He dwarfed the nearby mallard ducks and seagulls. He was also very calm as he quietly tore the fish apart. I figured there was no way I could get back to our buggy and get my camera out in time, but I ran with Buddy and grabbed the camera with the big lens on it that was sitting on the table. I noticed it was Mark’s camera, but heck, he wasn’t here. No problem! Just then, Mark opened the door. I shoved the camera into his hands and said, “Bald eagle! Quick! Run!” and pointed at the dock. He took off like greased lightning while I hunted around for my camera and got my big 150-600 mm lens loaded onto it. Then Buddy and I took off for the dock too. Even though quite a few minutes had passed, the eagle was still happily munching away on his fish. Some opportunistic seagulls were milling around nearby hoping for tidbits. Both Mark and I were able to fire off some wonderful shots of this gorgeous bird as he finished his meal. 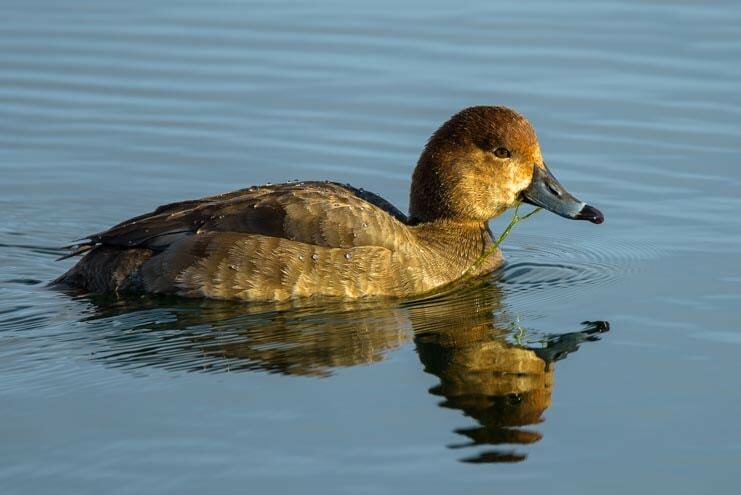 He needed to wipe his beak — which he did right before flying off. Then he wiped his beak on the wooden dock and pumped his wings hard to fly up in the air. Looking at the photos later, I just loved the puffy pantaloons on his legs. And then off he went. It had been another truly magical moment that soared into our lives and then flew away and into our memory. One morning I woke up early and lazily raised the blinds to see what was going on in the world. 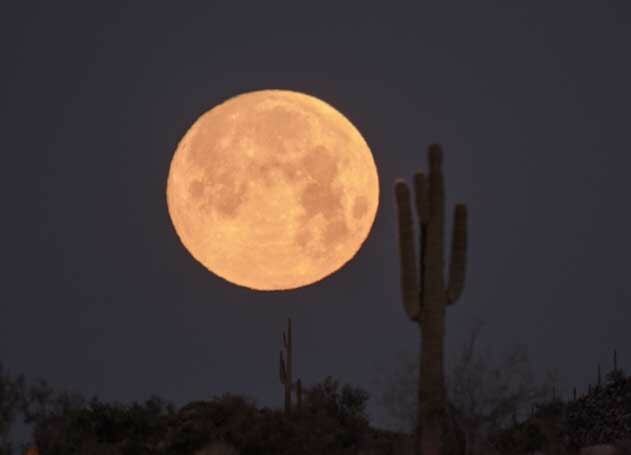 To my astonishment, a fabulous orange full moon was in the midst of setting. It was another incredible OMG moment that I wanted desperately to catch on camera. I tore through my clothes trying to find pants and a jacket and shoes as well as a camera with a long lens and a tripod to mount it on. Our sweet puppy Buddy is not a morning person at all, but he watched me in amazement from his cozy spot under the blankets as I threw things all over the place in a total panic. To get the biggest possible orb in the sky, I grabbed my beautiful brand new Nikon D500 that Mark had given me a few weeks prior for my birthday, and I attached my mammoth 150-600 mm lens to it. Being a crop-sensor camera, this effectively gave me a 900 mm lens. But unfortunately I hadn’t memorized all the buttons on my new camera yet, and as I stood outside shivering in icy blasts of wind, I couldn’t remember how to get the settings I wanted. The moon set right before dawn. As the moon dropped steadily out of the sky and slipped behind a saguaro cactus, framing a fabulous image I desperately wanted to capture, I chastised myself for not having taken the time yet to study this miraculous piece of gear. Mark heard all the commotion and suddenly appeared at my side in his skivvies and bare feet as the bitter wind whipped across the lake. He gave me one of those “are you kidding?” and “tsk tsk” kind of looks and calmly showed me the buttons I’d been looking for. We both got a good laugh, but we couldn’t wait to get another chance for better pics when the moon set at the end of the day. We would be prepared this time! So, late in the afternoon we watched for the moon to rise which happened right as the sun was setting. 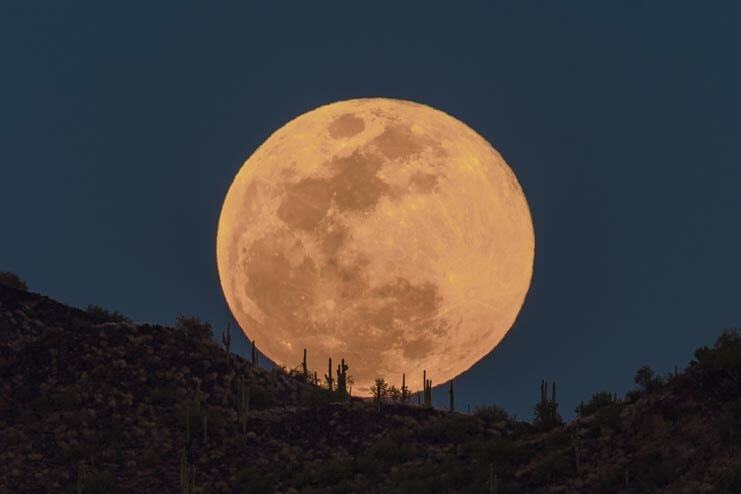 (For those who haven’t studied the night sky, that’s how full moons work: they shine all night long, rising at sunset and setting at sunrise). At dusk a full moon suddenly rises behind a ridge. 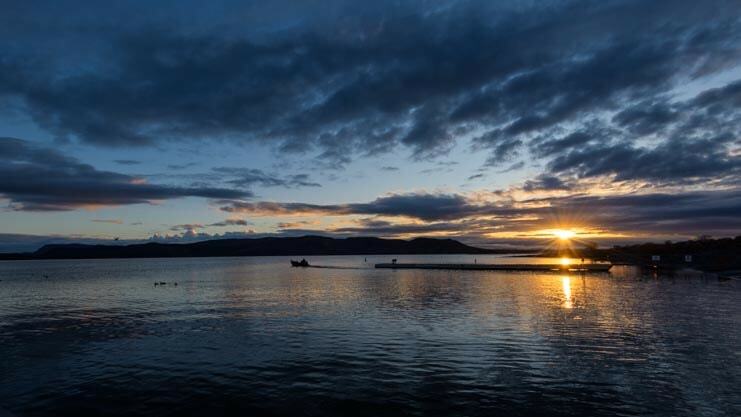 It rose across the lake, casting a beautiful shaft of orange light across the water and the docks where a man was peacefully fishing. It was another magical moment. Fishing by the light of the moon. The next morning we set the alarm so we wouldn’t miss the setting of the moon. This time we were completely prepared with all our gear laid out, including our Hoodman loupes, so we could see exactly what our pics looked like, and our remote shutter releases to help the cameras stay perfectly still as we took each photo. The moon set about an hour later than it had the morning before, so the sky was lighter, and the moon’s path was quite a ways left of where it had been. 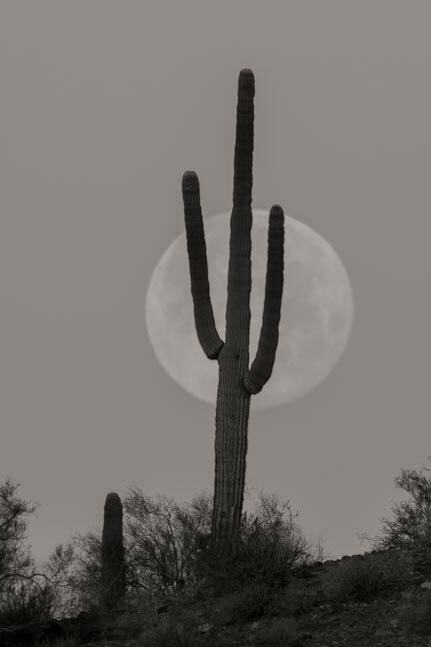 We moved our positions so we could line the moon up with a different saguaro cactus. 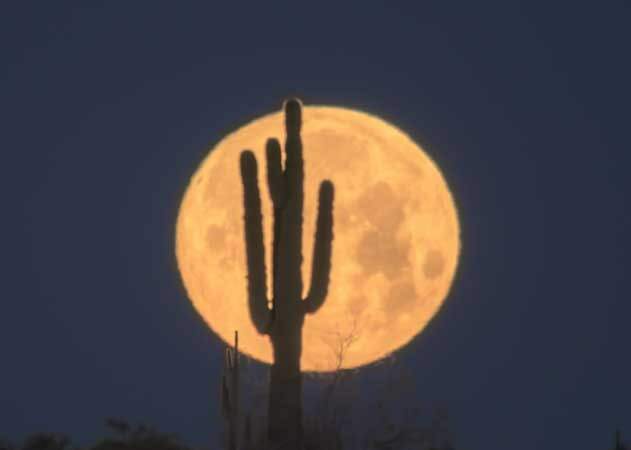 Then, slowly but surely, the moon sank behind the cactus and we each got some very satisfying shots. 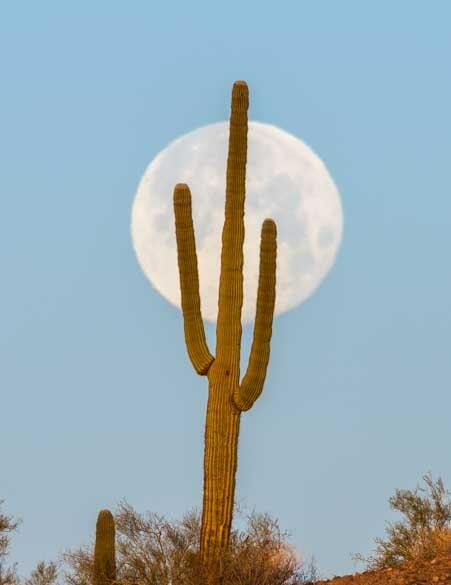 The moon sets behind a saguaro cactus. 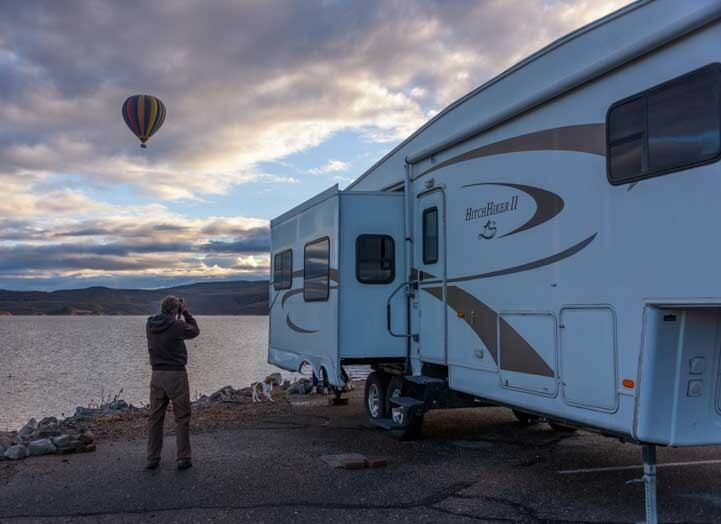 It’s hard to describe the beauty of our RV lifestyle, because the most wondrous part is when beautiful surprises come to us unexpectedly. We couldn’t script happier days than these very special ones that were filled with such magical moments. 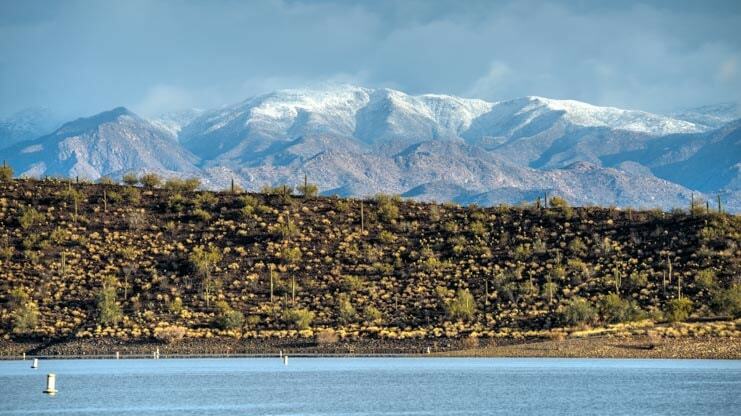 This entry was posted in Arizona and tagged Arizona, Arizona Central, New, Travel, USA, WP Travel by Roads Less Traveled. Bookmark the permalink. Wow, let me be the first person to admire those beautiful photos of the full moon! How do you guys do it! Beautiful, just beautiful! Thank you Mark and Emily…again! The early bird catches the worm, Pete, or maybe the fish!! Thank you for appreciating our pics. It has taken a lot of study and loads of mistakes, but learning to take photos that do justice to the things we see has been immensely rewarding. Just like mistakes made learning how to RV (like zooming off with a slide-out still partially open), the mistakes we’ve made in photography (like receiving a fabulous camera as a gift from Sweetie and not learning where the buttons are to set the ISO and exposure delay only to be stuck staring at a great moon shot in blustery winds and freezing cold and being shame faced when Sweetie saves the day in his boxers and bare feet) are funny but drive home the point not to make the mistake twice!!! Absolutely stunning pictures! 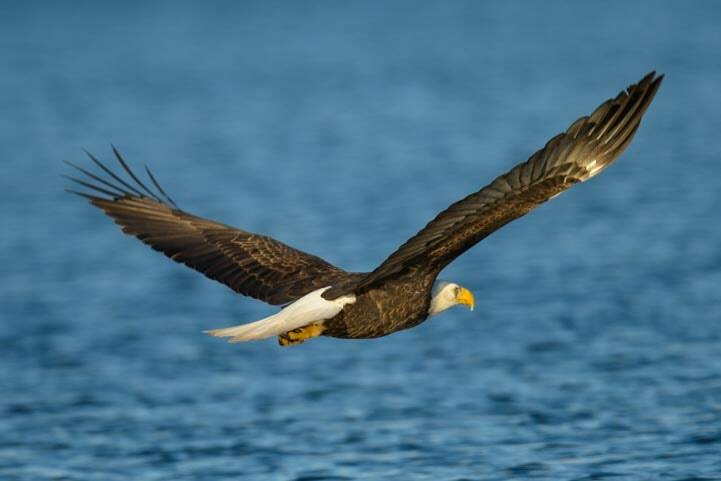 I actually have the opportunity to see a pair of bald eagles daily where I live and every time I do it’s always the same reaction of how amazing this beautiful bird is. What camera and set-up are you using to capture these beautiful photos if you don’t mind be asking? Love your blog by the way. Safe travels. Thank you very much, Katherine. How lucky you are to see a pair of bald eagles on a regular basis. They are truly majestic birds! We used a combination of the Nikon D500 camera and Nikon D810 camera and both the older Tamron 150-600 mm lens G1 and the newer Tamron 150-600 mm G2 lens. The Nikon D500 has a crop sensor in it, so when it has the full-frame Tamron 150-600 lens attached it is like using a 225-900 mm lens – big big big! The eagle shots were hand-held (resting the lens on something) but we used tripods for the moon shots. We have an article describing our camera gear and how we learned photography here. And we describe our tripods here. Just beautiful! And what a cute dog. Thanks for sharing. Thank you, Jill. Buddy is an absolute angel. 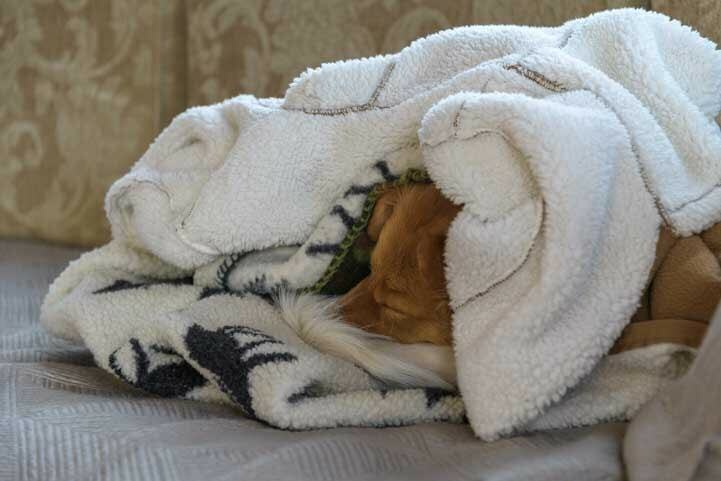 He has already been up and done his business this morning but returned right back under the covers for a few hours’ snooze while we drink our coffee and tea and lounge around!!! Lol! Bet you were embarrassed when he showed you the iso button right there near your index finger! Love my d500. Can’t believe I haven’t run into you guys we all stay at same places. Hope you have a good summer. OMG Yes! I knew it was there somewhere but it was dark and I didn’t have my glasses on and there were three buttons in a row and I didn’t want to hit the wrong one and really screw myself up. Too funny! I do mechanical things by rote once I memorize them and Mark does them by thinking about the underpinnings of how they work. We’ve had some hilarious discussions about shifting bike gears and what we’re thinking as we do it. The D500 is an awesome camera. Mark had his for a few months first and I was so envious of the sharpness of the images he was getting and figured it was his steady hand. Then I got mine and could effortlessly rattle off 10 awesome pics in a row of Buddy sprinting. Your pics are beautiful, Jan. Those images you got of the foxes are just wonderful. I love the one of the fox peeking through the grass. I hope we run into each other out here someday. Happy travels and happy shooting! What a life! Thanks for sharing…again and again. I haven’t commented on Buddy yet, but I am so glad he adopted you guys. He is a great addition to your RV lifestyle. Being a capital “D” dog person, I’m not surprised that he has totally taken over as the center of attention. He will give unconditional love and great companionship for both of you for years! Thanks again for the excellent story! Thank YOU, Jeff, for your kind generosity AGAIN!! We appreciate it more than you know! We are both completely smitten by our fuzzy little guy. We never would have guessed how much a sweet furry face and all its cute expressions would brighten every day for us. He just bounded outside (with Mark dashing behind) to greet all the neighbors. Such a vivacious personality! Hi Annie – Buddy is definitely growing and he’s getting a wonderful thick coat too. 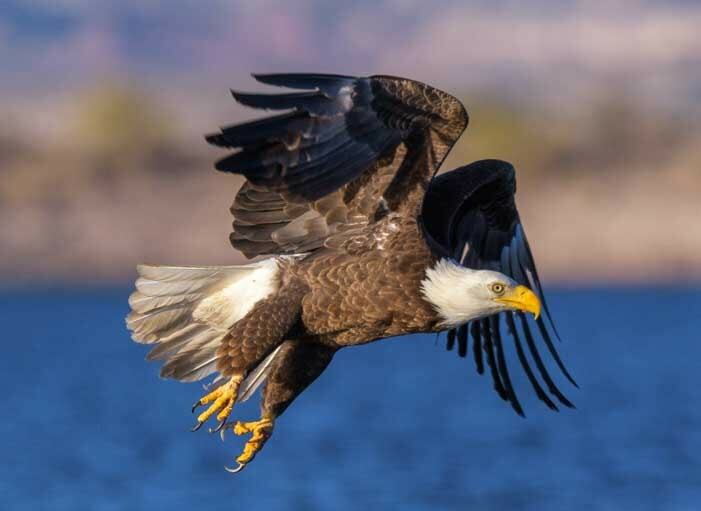 Eagles are such great birds and we’ve seen quite a few in AZ over the years, but never through our long lenses. Next time you get to southern Utah, see if the “Eagle Whisperer” Martin Tyner is releasing a rehabilitated raptor. We witnessed a golden eagle release that was sensational and very moving (blog post here). Just a brief reply to your comment that the golden eagles “dwarf the bald eagles.” It depends on where you are in N. America–in Alaska where I live bald eagles dwarf golden eagles. Although golden eagles do have a talon grip strength almost 50% greater than bald eagles in general, the baldies are much larger in Alaska. I have been a raptor/eagle trainer for several years and both of these eagles are magnificent creatures. I too thoroughly enjoy Emily and Mark’s blogs and travels–hope they keep up the great articles and photos. We are so lucky to be living the good life, Deborah, and we love sharing our experiences. Thank you for appreciating our pics and stories. 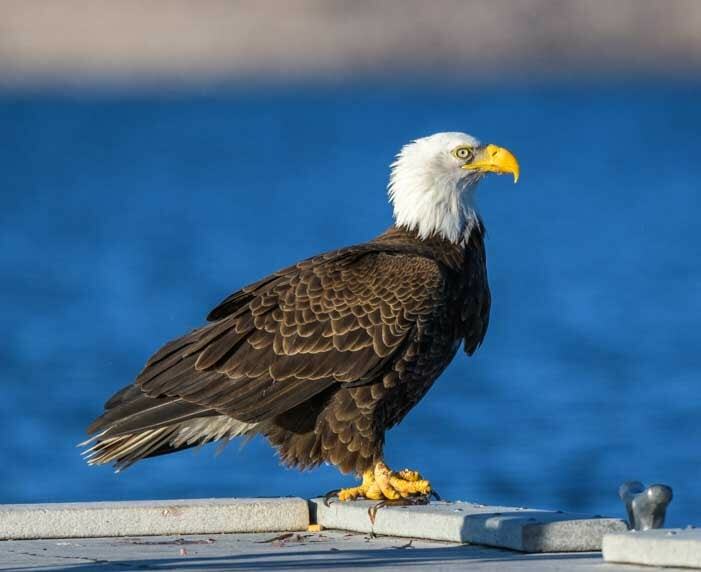 An up close bald eagle sighting is out there waiting for you!! 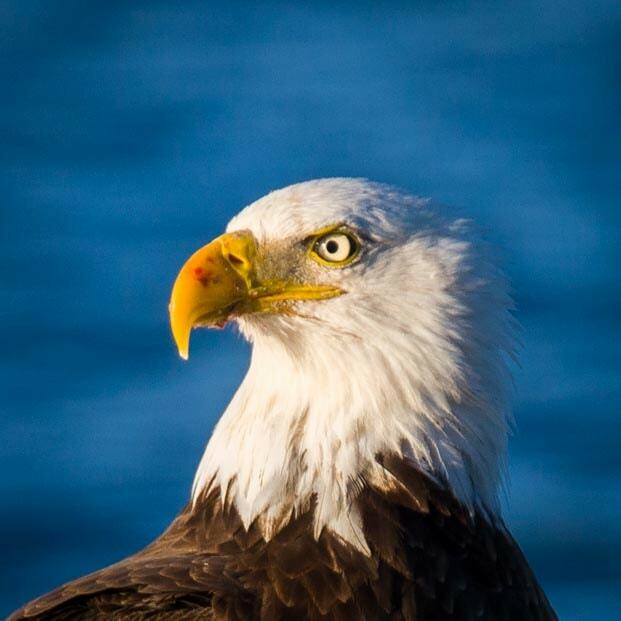 Those are amazing photos of that bald eagle! 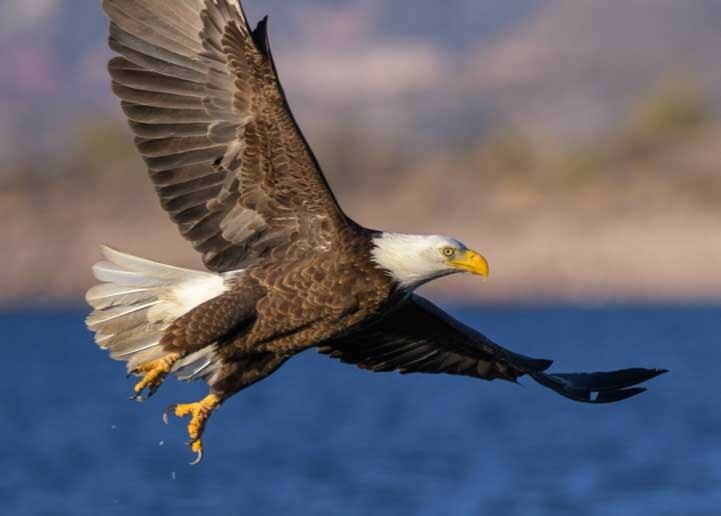 Amazing photos and story all around, really, but wow, that bald eagle! The amazing thing to us was that he stayed there for so long. There was a crowd of about 8-10 people watching him, and three of us were able to creep up quite close by taking just a few steps at a time. It was a total thrill to watch him! Great post! Loved the eagle shots and moon shots. Also enjoy the camera discussions. Thanks, Liz. We sure got lucky that eagle stuck around long enough for us to get our cameras and sneak up on him! You’d love the discussions in our rig. We talk about photography and new techniques we’re learning all the time!!! Wow! Your pictures are AWESOME! 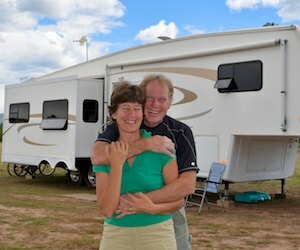 Thank you for sharing the pictures and information on RV life. We look forward to full time RV-ing in 2022. Please, keep posting!!! Thank you for following our travels, Shelly. You’ll have a blast out here once you launch your new lifestyle in 2022. In the meantime we’ll be sharing lots of pics and stories from wherever we go! I love it too with the puppy looking off towards the sun! Terrrifiic pictures…thanks so much for getting up so early for our enjoyment! 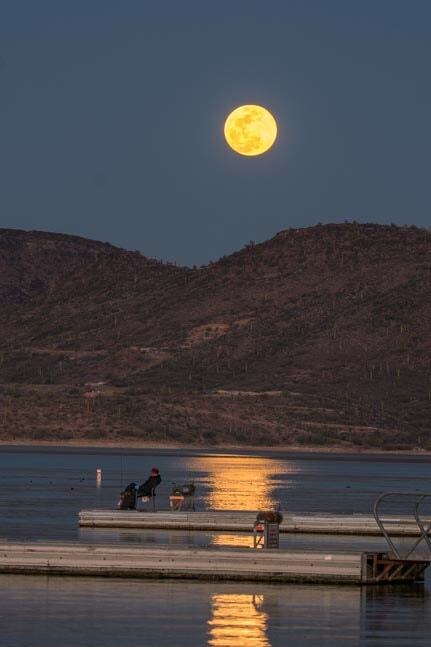 Lake Pleasant is a great campground and the eagles are a big bonus. We didn’t see any on our stay there last spring but we did have some wild burros in our camp – so cool!!! Love your new addition, Buddy …what a darling boy he is. I can see why you are so smitten!!! How long are you in AZ? How fun that you saw the wild burros, Brenda. We’ve seen lots of evidence of them from their droppings, but we’ve spotted them only twice from a long distance away. We don’t plan to be in AZ much longer, but we’ve been saying that for the last month, so who knows!! Such amazing pictures! Thanks for sharing. Just love the eagle and moon pictures. Thank you, Debbie. We were lucky to have these unique images float into our lives unexpectedly! !